Season the hens well inside and out with salt and pepper. Place in a pan and bake at 350 degrees for one to one and one half hours, basting frequently with sauce made from blending butter and California white wine or with chicken consomme if you prefer. When done serve with this dressing, or your favorite dressing. Put the bread crumbs into a bowl. Cook the celery slowly in the butter in a saucepan for about five minutes. Pour over the bread crumbs, tossing to blend. Sprinkle the onion, sage, pepper and water over bread crumbs. Beat egg lightly and add to bread mixture. If mixture is not moist enough to shape into balls, add one or two tablespoons water. Mix in the almonds and shape into balls. Place the dressing balls in a shallow greased pan and bake at 350 degrees F for thirty minutes or until brown. 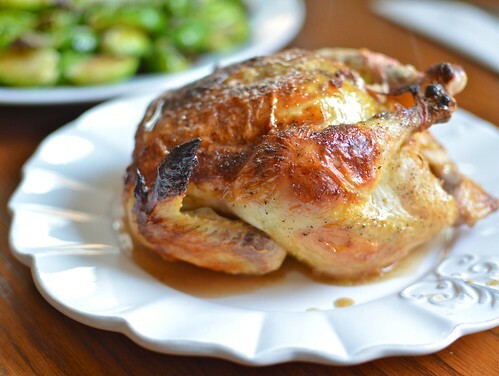 Serve with cornish hens.